An ancient necropolis discovered during construction works of a cultural center in Turkey's southern Antalya province will be turned into an open-air museum and welcome local and foreign tourists alike in March. Dating back to the third century B.C., the necropolis was accidentally unearthed in 2008 during construction works of the Eastern Garage Project carried out by Antalya Metropolitan Municipality. Spread in an area over 9,136 meters, the 2,500-year-old burials will be turned into a sightseeing attraction after its construction works are completed by February, the Assistant Secretary General of Antalya Metropolitan Municipality Bedrullah Erçin told the Anadolu Agency. 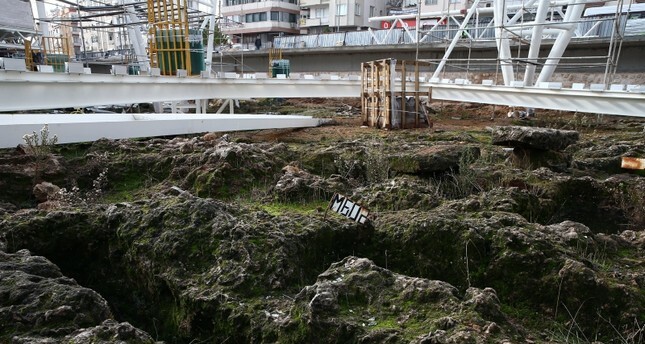 There will be a concert and conference hall in the museum, Erçin said, adding that excavation works to unearth other burials will continue while archaeologists continue to restore the burials. Erçin noted that the museum is expected to be open to visitors by March, but the exhibition and design projects may take another year to be completed. Archaeologist Mehmet Şengül noted that the necropolis is a part of the ancient city of Attalea, which dated back to the third century B.C. Walking trails made out of glass will be made at the necropolis, Şengül said, adding that the trails will allow visitors to see the burials and artifacts. "There were human skeletons, presents and archaeological items inside the burials," Şengül said, adding that some of these are currently being exhibited at the Antalya Archaeology Museum, and the rest are stored in a storeroom so they can be moved to the museum once it is open to visitors. Şengül also noted that the original artifacts will be displayed at the museum and people will see the replicas beside the burials in the trails.